Listen to the Art of Education Podcast on Design Thinking and the Visioneer Challenge. Click the button below. What is the approach to this competition? Individuals or small teams of two or three compete in design areas. 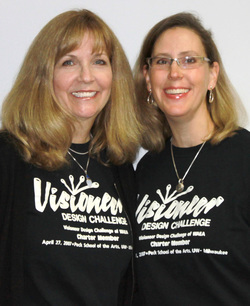 Visioneer Design Challenge could be integrated within your curriculum or set up as an after school program. Note: A student may compete in only one design area. Please read carefully. We are trying to improve how you register your school and students. Register your school and students for their challenge. Registration is now open. Challenges will have limited space. 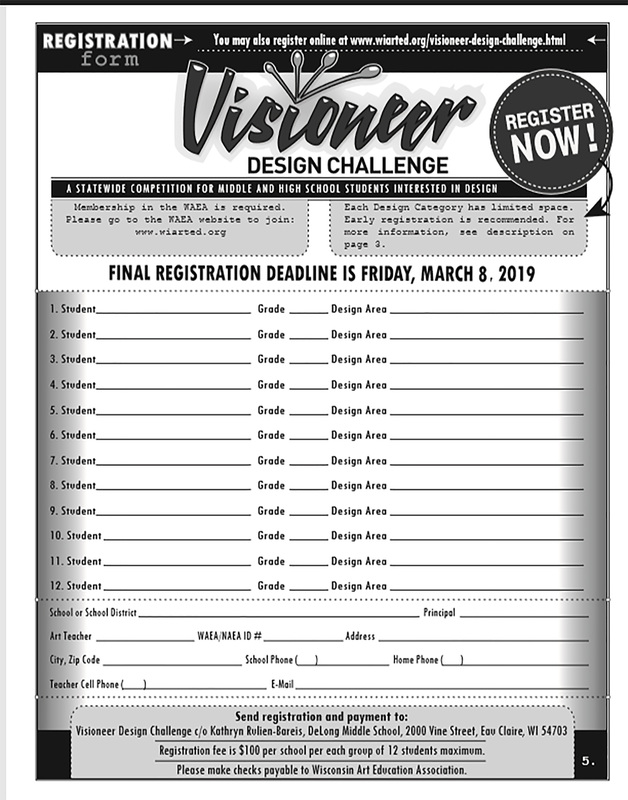 What is Visioneer Design Challenge? ​What is Visioneer Design Challenge? The Visioneer Design Challenge is a unique, one-of-a kind, statewide learning program and competition for middle school and high school students interested in design arts and connecting with professional designers. Challenges have been developed by professional designers who currently work and have careers in design fields. These challenges cover design in everyday things, design of spaces and places, design for communication and information and design for human interaction. This program may connect directly to your school district’s goal of preparing students for post-secondary readiness. Some examples of design areas since the program’s launch have included: Architecture, Animation, Digital Photography, Exhibit Design, Fashion Marketing, Game Design, Graphic Design, Illustration, Interior Design, Point-of-Purchase Design, Product Design, Urban Planning, Video Production and Web Design. Students in grades 6-12 who are gifted or talented in the visual arts are eligible. These students may be identified by your district as Gifted and Talented. (Your G/T department may support this program financially as it is considered a state competition.) We welcome all students who are artistically gifted, have demonstrated advanced creative thinking skills and are intrinsically driven with genuine love for the arts. Please study the VDC program that is available on this website and blog and encourage your students to commit themselves to various challenges. These are real world of work challenges that are exciting for students to solve. As you know, these are exciting times in art and design education as things are changing, technology is an awesome tool, and you are motivating students involved in taking charge of their own education. Students do learn more and more deeply when they are confronted by interesting problems to solve. When they are seeking new directions and answers, developing imaginative and creative thinking, solving challenging problems, taking risks, and using design to expand their 21st c world, you are opening new creative opportunities for them. They learn to integrate and connect art and technology. Your role has changed. If you did not teach in this manner before.....you are the GUIDE, the MENTOR, and the MOTIVATOR for enabling your students to enjoy learning and to learn in their own way of understanding. Perhaps you have the next Steve Jobs in your class or the next Steven Spielberg..........or Einstein. Who knows? Wonderful surprises are discovered when you see what happens with students involved in this program. Even the design professionals are amazed at what these students are capable of achieving. You have the wonderful opportunity to provide those you are privileged to teach/guide to open up fields of learning and creativity they would otherwise never experienced. Being a teacher is the highest profession and you are highly valued by students as they look back on what they have achieved and the manner in which they were given the opportunity to do so. You will be their hero years from now as some of these same students look back on all the opportunities you gave them to have a great education. This program is the only one of its kind in the US. Others are watching what you do and how you are developing this program statewide. Please do not say that you do not understand technology and therefore do not want to take on this program. The students can do it. It is their world. You don't know all the answers and that is fine. None of us do. Technology is always changing and life is also. Learning is a lifetime activity and we learn along with our students. That’s what makes it so very exciting. This is a WAEA program. Get your students excited about this opportunity. GO FOR IT. Sign your students up soon.